We’re in the midst of a bit of a late Spring heat wave here in Wellington and today it got as hot as 24°C. For those of you not super quick at converting celsius to fahrenheit (I’m getting there), that’s 75°F. Seventy-five degrees fahrenheit. It’s a wonder I survived! Maybe I didn’t survive. Maybe I’ve died and gone to heaven – because this is my ideal weather. My hatred for hot temperatures is widely known to my friends. Unless I am in the middle of leaping into a pool I can barely function once the mercury slips past 80°F. When Philly gets into the 90s I go into complete system shutdown. I’d often remark that it would be nice to move to somewhere with lower highs, like the Pacific Northwest, but I never imagined I would move to place like this – where the average temperature is never over 65°F, it never drops below freezing, it hardly ever gets higher than 77°F, and the worst heatwaves of all time top out in the mid-80s. When you live somewhere where the temperature basically ranges from “chilly spring” to “warm spring” for the majority of the year, if you cannot be outside at the very least you want every possible window open. Luckily, our house has a lot of windows – including skylights – which means there’s double the motivation to open them, as spending a whole day indoors can start to feel like you’re under a magnifying glass. 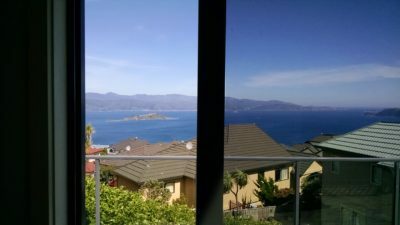 Here’s the rub: of the many quirks I have discovered about Wellington, one is that they do not seem to believe in window screens. Even believing in properly functioning windows is a bit of a hit-or-miss endeavor from house to house here. The Wellington region is notorious for not-so-well insulated homes, which perhaps seems moot given the ideal temperature range. However, that doesn’t take into account moisture. When we were shopping for a rental it was impressed upon us to search for houses with double-paned glass windows that seemed to adequately seal. Of the over-a-dozen houses we saw, I’d say only three or four fit the bill. Yet, even in the most beautiful, modern home with thick, well-sealed windows, you are 99.9% likely to discover that not a single window or door in the house has a screen. In fact, they probably couldn’t even fit a screen, since windows here are frequently massive casements half as tall as me or multi-part horizontal sliding doors that might open an entire wall. I find it completely puzzling. As someone who grew up owning cats (and, at one point, a bird), you could not possibly leave a window open more than a crack or else they would find their way out! Plus, who knows what kind of dastardly squirrels and scuzzy pigeons would find their way in. Which is not to mention that screens gave your windows some minor illusion of providing security for your house even when they were open. We don’t have pets here, there are no squirrels, and I don’t think the rate of crime is anything like Philly. Of course, there are still bugs. Even as I’ve typed this post I’ve already squashed two, chased out a third, and swatted at a fourth. Maybe this is an symptom of living a sterile, homogenized, American lifestyle in the states for over 30 years, but I cannot be comfortable in my own home if their are bugs in my line of sight or range of hearing. Nope nope nope. Aside from the gross-out factor, as someone whose Hulk-like rage at high frequency sounds borders on misophonia, the buzzing of a fly borders on debilitating for me. Back in Philly I finally made my own squicky peace with spiders and house centipedes if they kept to themselves, since they ate other bugs, but not if they wanted to chill out in plain sight. Nothing else was allowed. All of these factors were on my mind as the weather got progressively more stunning in Wellington. We have one large sliding door with no screen in our living room that opens onto our beautiful view, and after trying and failing to figure out how to construct a screen that would sort of unroll as I opened the door I finally convinced myself that not that many bugs could get in through the door if I opened it a few inches. That was before the weather got into the 70s. Now, it’s just painful to be looking out of the windows at that beauty but not be able to breath it in and feel the omnipresent Wellington wind. I had to open more windows. I began to crack the window over the kitchen sink to create a draft across the house from the sliding door. Then came the bugs. So many bugs. I don’t know if they want to be in here because it’s warmer, or because they smell food, or because they’re just carried in by the draft, but they were constant. I couldn’t got five minutes without shooing out a fly or a bee. I certainly wasn’t going to give up on enjoying the breeze, so I took the next best option: I opened more windows. I figured that way the bugs could more easily find their way out! Well, the big buzzy bugs come and go a little more readily now, but now the house is riddled with other bugs. Tiny bugs! Moths! Little creeping things that look like an ant crossed with a scorpion! Massive, terrifying, spindly things that look like a cross between a mosquito and a spider! It’s gotten to the point that I am fairly certain there is a bug on my person every single moment I am inside the house and I. Just. Can’t. Deal. Maybe if we owned the house I would go on some kind of window-replacing rampage to install screens in some key spots, or hire some handy person to engineer screens where my imagination has failed me. Without those options, I think the only solution might be spending more time outdoors (a conclusion at which I suspect most Kiwis have already arrived). Sure, that’s where the bugs actually live, but we’re not in an enclosed space together and – again – it is my ideal temperature at all times here. There are worst fates than writing a blog post from our deck. Previous Post: « Crushing Comics S01E30.1 – Thank you for watching 30 videos in 30 days!